Fry Art Gallery secures work by influential 20th-century artist with major National Heritage Memorial Fund grant. The Fry Art Gallery, Saffron Walden has acquired the watercolour “Two Women in a Garden”, a rare early work by Eric Ravilious, one of the 20th century’s most important and influential artists. 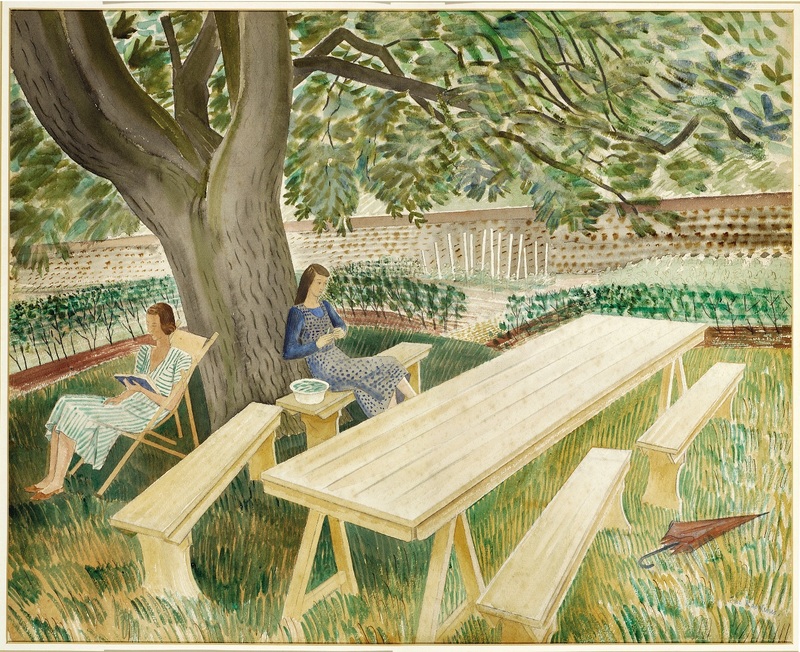 The painting depicts artist Edward Bawden’s wife Charlotte with Eric Ravilious’s wife Tirzah in the garden of Brick House, Great Bardfield around 1933, where the two couples lived. It is at Great Bardfield where the artists set about ‘reviving the art of English watercolour’ and the house became the centre for the artists collectively known as the Great Bardfield Artists. The movement peaked in the 1950s. The painting offers a rare glimpse of Ravilious’s domestic life and also shows the beginnings of his highly distinctive style. The painting has been on loan to the gallery for a number of years and will now become a key piece in the gallery’s North West Essex Collection. The purchase was made possible by £130,000 from the National Heritage Memorial Fund (NHMF) along with further funding from the Arts Council England/V&A Purchase Grant Fund and a contribution from the gallery’s own resources. Born in London, Ravilious was a painter, designer, book illustrator and wood engraver. He studied at the Eastbourne School of Art, where his early talent was recognised. He was awarded a place in the Design School at the Royal College of Art (RCA), where he studied under Paul Nash, and met fellow students with whom he would form lasting personal and professional relationships, including Edward Bawden, Douglas Percy Bliss, Barnett Freedman, Helen Binyon, Enid Marx and Peggy Angus. After the RCA he returned to Eastbourne to teach at the School of Art where in 1930 he married one of his students, the talented artist and engraver Eileen Lucy "Tirzah" Garwood. Ravilious was appointed an official war artist in Second World War and received a commission as a Captain in the Royal Marines. He was killed in 1942 at the age of 39 while accompanying a Royal Air Force air sea rescue mission off Iceland that failed to return to its base. This private treaty sale, a Government scheme which encourages owners of important heritage assets to sell them to Museums and Galleries, was facilitated by Uttlesford District Council as intermediary, whose assistance was essential. The National Heritage Memorial Fund (NHMF) was set up in 1980 to save the most outstanding parts of our national heritage, in memory of those who have given their lives for the UK. It will receive £5 million of Government grant in aid in 2018/19 www.nhmf.org.uk. The Arts Council England/Victoria and Albert Museum Purchase Grant Fund is a government fund that helps regional museums, record offices and specialist libraries in England and Wales to acquire objects relating to the arts, literature and history. It was established at the Victoria and Albert Museum (V&A) in 1881 and continues to be part of its nationwide work. The annual grants budget, currently £750,000, is provided by Arts Council England (ACE). Each year, the Purchase Grant Fund considers some 200 applications and awards grants to around 100 organisations, enabling acquisitions of over £3m to go ahead.